The Interrupters won the Emmy for "Outstanding Informational Programming—Long-Form" tonight in New York City at the News and Documentary Emmys. We at Kartemquin are honored to receive this award, which is shared especially with FRONTLINE, the PBS program that broadcast the film in February 2012, and our production partners ITVS - The Independent Television Service, Rise Films, and distributors Cinema Guild and Dogwoof. Of course, a further special mention must be made to CeaseFire Illinois (Cure Violence) and Ameena Matthews, Eddie Bocanegra, Cobe Williams, Tio Hardiman and Gary Slutkin for sharing their story. 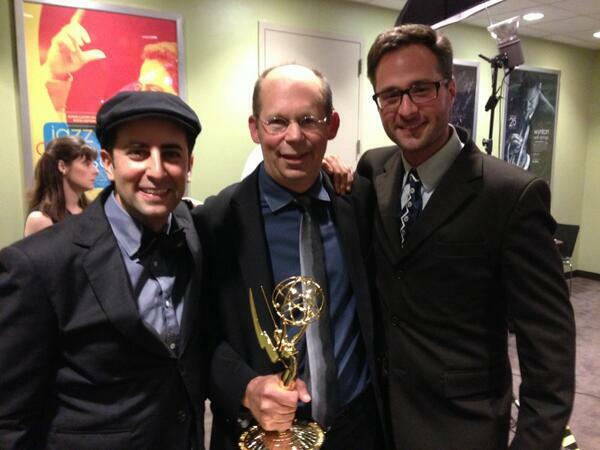 Pictured right with the award are Co-Editor Aaron Wickenden, Producer Alex Kotlowitz, and Co-Producer Zak Piper. Photo by Executive Producer Justine Nagan. Not present: director/producer Steve James! The Interrupters was also nominated "Outstanding Editing: Documentary and Long Form" (by Steve James and Aaron Wickenden), and we also received a nomination in the "Outstanding Investigative Journalism—Long-Form" category for As Goes Janesville. We are greatly honored to receive this recognition from our peers in the documentary and journalism industry.